Syntax is the system of rules that we subconsciously follow when we build sentences. Whereas the grammar of English (or other languages) might look like a rather chaotic set of arbitrary patterns, linguistic science has revealed that these patterns can actually be understood as the result of a small number of grammatical principles. This lively introductory textbook is designed for undergraduate students in linguistics, English and modern languages with relatively little background in the subject, offering the necessary tools for the analysis of phrases and sentences while at the same time introducing state-of-the-art syntactic theory in an accessible and engaging way. 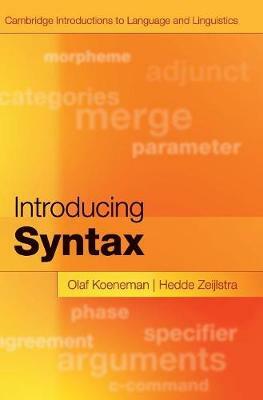 Guiding students through a variety of intriguing puzzles, striking facts and novel ideas, Introducing Syntax presents contemporary insights into syntactic theory in one clear and coherent narrative, avoiding unnecessary detail and enabling readers to understand the rationale behind technicalities. Aids to learning include highlighted key terms, suggestions for further reading and numerous exercises, placing syntax in a broader grammatical perspective.